The original GRC clubhouse, was known as the Blackening Box, by the Waterside in Woodquay. This building was later replaced in 1969. 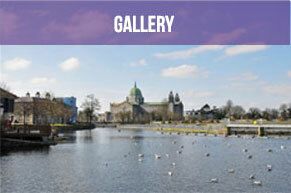 “In 1908, a group of members of the Temperance Rowing Club joined St. Patricks Rowing Club. They included Richard Walsh, Jack Monahan, James Kelly, Tom Shaughnessy, Larry Sarsfield, Eugene Hickey and Dennis Hickey. They found that the senior members had full control and could not get any agreement to row in the 1909 Regatta at Galway, as the elders decided this. When they were effused, they were told they could row for the Hibernian Rowing Club (later to be known as the Galway Rowing Club), if they could get a loan of a boat. They succeeded in this, and competed against the St. Patricks Club crew. The clubs at this time were not affiliated to the Rowing Union and therefore could hold a regatta at any time they wished and could use any kind of boat. During the race the rudder of the boat coxed by Denis Hickey got caught in the control cords and they ran into rushes. The crew comprised of E. Hickey, Ned Fahy (later Irish half mile champion), Martin Feeney, and A. N. Other. D. Hickey was cox. These members joined the Ancient Order of Hibernians with a view to forming a rowing club (it already was a boat club). They had a resolution passed at a meeting to have the club made a rowing club and that is how it became known as Galway Rowing Club. It was known as “the Blackening Box” because every year it was tarred to preserve the clubhouse. The Galway Rowing Club, originally called the Hibernian Rowing Club, was founded in 1910 in Woodquay. It was to be called the Celtic Club, but members were anxious to avoid any political associations. In fact, through the years and even now the club is still referred to as “The Hibs”. There were many fine crews in the club right from its inception, winning at many regattas around the country, and many races between the towns club in Galway. 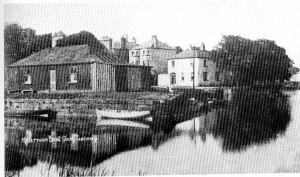 The club was situated, and still is, down by the Waterside in Woodquay. The clubhouse had been given a nickname, “the Blackening Box”, due to the black tar that was spread on the club to help preserve it. However, it wasn’t until 1948 that the club made its big breakthrough onto the Irish rowing scene, winning its first IARU Championship by clinching the mens Maiden Eights in Athlone, defeating Trinity College by two feet. The history making crew was: Martin Reddington (bow), Jimmy Elwood (2), Mickey Elwood (3), John Elwood (4), Brod Conneely (5), Patsy Hughes (6), Martin Dolan (7), Oliver Melvin (stk) and Richard ‘Canty’ Walsh (cox). The crew was coached by Bertie Kavanagh. On their return to Galway, the crew and their supporters paraded through the town to Woodquay, led by the Dockers’ Band. There was also a great reception held for them in the Hangar Ballroom, in Salthill. Later in that season the same crew were defeated in the Mens Junior Eights by two feet. However, this just prolonged their triumph as the following season they went on to clinch the championship, defeating Waterford by just two feet in Cork, with just one change to the crew from the previous season. Jimmy Elwood had gone to America and was replaced by Jackie Mannion. Again, like the previous season, there was a massive reception held in honour of the victorious crew in the Hangar Ballroom, in Salthill. This crew formed the basis of senior crews which won trophies at regattas all around the country during the next few years, but following a narrow defeat in the Palmer Royal Trophyat Galway Regatta in 1953, many of the oarsmen retired and the club went into a decline which lasted for nearly two decades, with brief intervals. In the late 1960’s some major fundraising was held by members of the rowing club. There was a hurling match organised between the club and local hurling team Liam Mellowes in the Sportsground, which Mellowes went on to win. Also, the club became the first club in Galway to host a ‘Monster 25 Card Drive’ to raise funds for the clubs development, wioth the prize being a pony. In 1969, the major redevelopment of the GRC clubhouse was undertaken, mostly through voluntary labour of its members, supporters and people from around Woodquay. This major project, lead by Jim ‘Ruacan’ Heaney of Woodquay, resulted in a new spirit and enthusiasm which resulted in a resurgence of activity on the water. The Mens Junior 4 of Durcan Forde, Martin Fahy, Nicky Hardiman, Miley McGrath and cox PatHughes formed the backbone of the club at this time, winning every regatta in the country at the time, but being very unlucky at the IARU Junior Championships, being defeated by Garda. Also, the same year the Hughes Cup was launched for beginner oarspeople to race for on Christmas morning, a tradition that is now into its 30th year this Christmas and is still going strong. In 1974, all the effort of many people finally paid off, culminating in the winning of its first championship since 1949, the Mens Junior Eights. The race was originally called off due to bad weather but was rowed two weeks later, where the club went on to win its third Irish Championship, by the all-conquering 1974 crew which won at Trinity, Cork, Limerick, Athlone, Carlow, Waterford and Galway. The crew was coached by Sean Coll and Martin Fahy. Another highlight of this period came in 1976, when a Ladies Senior 4+, coached by Paddy Lally, won an international event at Nottingham International Regatta. There were further successes in the 70’s and 80’s, with the club winning at regattas across Ireland and even in England in the mid-late 80’s. However the club didn’t win its next championship event until 1988, with the Mens Novice Four, again coached by Paddy Lally and the Mens Novice Scull of Tom Elwood. This crew, which were made up of Manus Crowley (stk), Tony Connaughton (3), Conor Maloney (2), Owen Diviney (bow) and Neilus O’ Connell (cox), started a major reform in the club, with the same crew members bar one going on to win the Junior Four and Pair the following season. Also, this season, the club became the first Irish club to compete in the world famous Boston Head of the Charles regatta, where the club entered a Club Eight, a Club Four and Club Scull which was won by Tom Elwood. The successful championship crew formed the back bone of the Senior Eight in 1990, which won the famous Leander trophy at Cork regatta. This was the first time in the club history to win this great event. Later that year members of that crew went on to win the Intermediate Fours and were beaten in the Eights by a canvas, a mere three feet. There was a major project taken on at the start of the 90’s to rebuild the boatshed of the club. Again, alot of this was done with voluntary labour from its members and friends. The club continued its success into the 90’s, leading to the winning of the Blue Riband of Irish Rowing, the Mens Senior Eights, the first time the club had ever won this championship. This crew became only the third ever crew in Galway to win this event, the famous Emmetts Eight in 1929 and the UCG Eight of 1987. The crew comprised of Malcolm Hosty (stk), Sean Heaney (7), Kevin Garvey (6), Luke Nolan (5), Vincent Breen (4), Tom Elwood (3), Conor Maloney (2), Adrian McCallion (bow), with Martin Forde (cox) and was coached by Miley McGrath and Mike Hackett. Also that year, Owen Diviney captured the Novice Sculls Championship, giving him five titles for the club, a feat which wasn’t bettered by anyone in the club for some time. 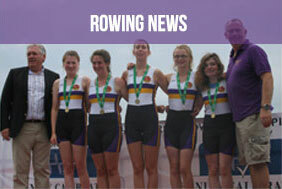 The club continued to be successful in the following years, especially with ladies crews. In 1994, GRC won the Womens Novice Four title, the first time this club had ever won this event. The crew, coached by Suzanne Golden, was made up Elaine Mannion (stk), Amy Lawless (3), Claire Cox (2), Mairead Madden (bow) and cox Danny O’ Dowd. Again this year the Novice Sculls Champioship was won in the club, this time by Conor Maloney. Also later in the year, sculler Owen Diviney and the successful Womens Novice Four went on to compete in the Boston Head of the Charles regatta, where Owen won the Club Singles event. Success continued in 1995, with two of the previous years successful Womens Four competing and winning the Womens Junior Pairs event. They completed an historic double at the Senior Championships the same year by capturing the Womens Senior Pairs event. The next championship wasn’t to come until 1998, when the Mens Junior Pair, Niall Diviney and Danny O’ Dowd, coached by Pete Heaney, captured the Junior Pairs title, the same championship won nine years previous by the club.Two years later the club captured the Mens Intermediate 2- championship, with John Forde and Danny O’Dowd taking home the glory. This was to be the first of many Pots for the two lads to win together. Danny went on to win the Mens Novice 1X title in 2004, having branched into sculling to try get on the Irish National team. John teamed up with Kenny McCarthy from Skibereen, to form a composite crew to race and WIN the Mens Senior 2- Championship. In 2006, the club joined forces with local neighbours NUIG (formerly UCG) to race for the Mens Senior titles. They crews won the Mens Senior 8+ (with John and Danny) and Mens Senior 4- (with John), as well as Mens Senior 2- composite again with John and Kenny McCarthy from Skibereen, while Danny won the Mens Lightweight 1X Championship. 2007 saw the resurgence of Junior rowing again, with wins for the Mens and Womens Novice 4+ crews, and a Mens Senior 4X- (composite Skibereen). In 2008 the club teamed up with Kenny McDonald of Shannon RC, and went onto win the Mens Senior 4- and Mens Senior 4+, while John Forde and Marc Stephens won the Mens Senior 2- and Danny O’Dowd teamed up to row and win Mens Senior 4X- composite with Skibereen/Offaly. In 2009, John Forde and Marc Stephens went onto defend their Senior 2- title. 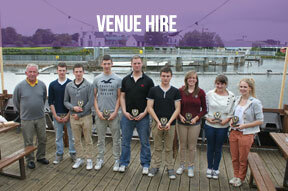 Galway Rowing Club also had and still has, a very strong social side to the club. For years one of the greatest events held was the St. Stephens Night annual dinner, where tickets were in great demand. Sadly however, this event is no longer held, the last one back in the 1980’s. Also, as mentioned earlier, the GRC was the first club in Galway to hold a Monster 25 Card Drive, with the first prize being a pony. Over the past number of years we’cve had numerous events such as ‘A Night at the Dogs’, sponsored rows, flag days etc to help raise funds for the club.The Annual social has also been resurrected and has taken place around New Years Eve time.